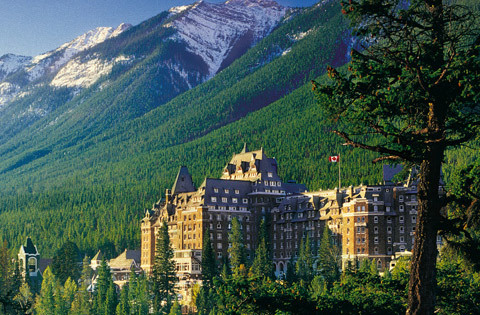 THE FAIRMONT BANFF SPRINGS HOTEL CNT. Modelled on a baronial Scottish castle, this huge resort on the outskirts of Banff opened in 1888.Sam the Bellman and Fiery Bride: This Canadian landmark boasts more than one spooky resident. Anyone who loses their keys should be on the lookout for Sam the Bellman, a former employee who retired in 1967. After passing away a few years later, he supposedly "returned" to the hotel. Dressed in 1960s-style uniform, Sam appears to assist those who have trouble with their locked hotel rooms, and when spoken to, vanishes into thin air. Best not lose your keys during your stay. And that's not the only ghostly guest on-site. In the 1920s a young bride's wedding dress caught on fire on a long spiral staircase in the hotel by the candles that lined the staircase. Panicking, she slipped and fell down the stairs and broke her neck. Employees have since reported strange noises in the bridal suite, and an apparition wearing a long flowing wedding gown is seen on the stairs from time to time, vanishing after catching on fire. FAIRMONT JASPER PARK LODGE - opened in 1922. Year-round full-service resort, it has onsite and offsite activities including hiking, mountain biking, horseback riding, and canoeing. 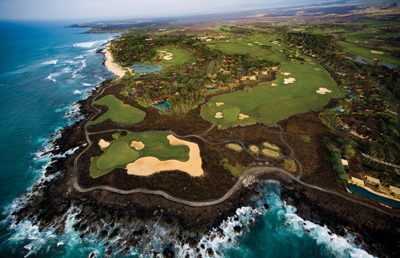 It has an 18-hole golf course designed by Stanley Thompson. Winter at the Lodge is outdoor oriented – cross country skiing, horse-drawn wagon rides, snowshoeing, and outdoor ice skating on Lake Mildred. HÔtel de Glace - every year, the Hôtel de Glace is redesigned and rebuilt in its entirety. THE HAZELTON HOTEL LHW. "Toronto's most exclusive hotel." Le Blanc Spa Resort - all inclusive luxury resort. Sol de Occidente - Costa Careyes. 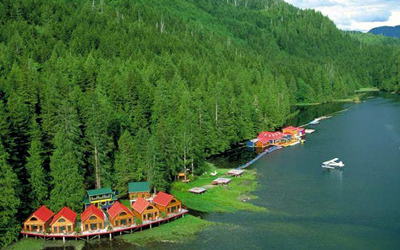 LAS HADAS RESORT - developed by Bolivian tin king ANTENOR PATIÑO. Also featured in the movie '10' starring Bo Derek and Dudley Moore. Beach scenes were filmed on La Audencia Bay, just over the hill from Las Hadas. 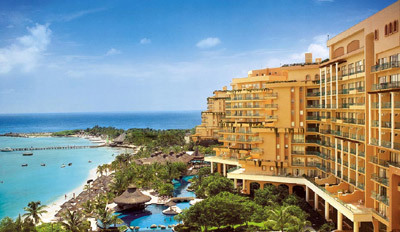 Grand Hotel ParaÍso - all inclusive luxury resort. 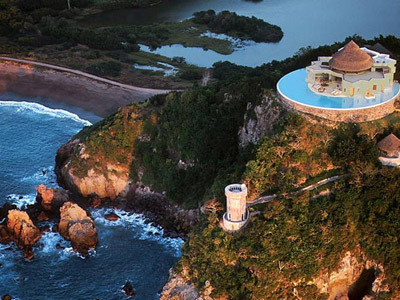 Has been named the best all-inclusive hotel in the world 2013 by TripAdvisor users. 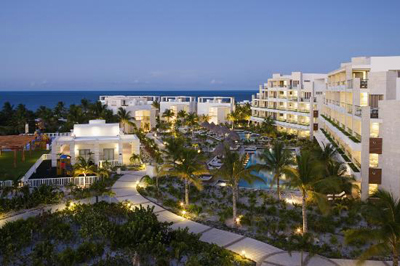 Secrets Maroma Beach Riviera Cancun - all inclusive luxury resort. Excellence Playa Mujeres - all inclusive luxury resort. 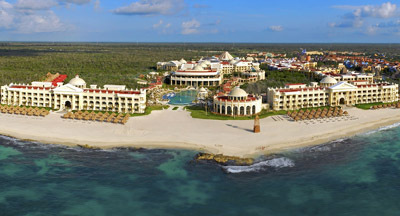 The Beloved Hotel - all inclusive luxury resort. 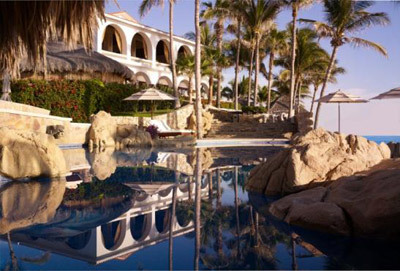 The St. Regis Punta Mita Resort - "Give in to the seduction of pampering treatments in the luxe Remède Spa, play on two Jack Nicklaus Signature Golf Courses or a tennis center nestled in a palm grove. Nearby, the Marietas Islands beckon with natural beauty and outdoor adventures." 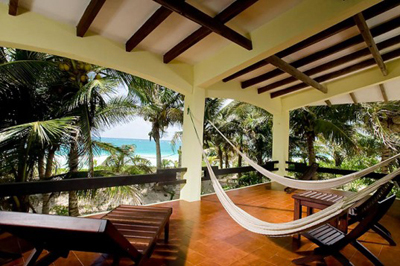 Casa de las Olas - eco-luxury escape on a secluded white sand beach. Sustainably powered by solar panels and kept comfortable with geothermal cooling. 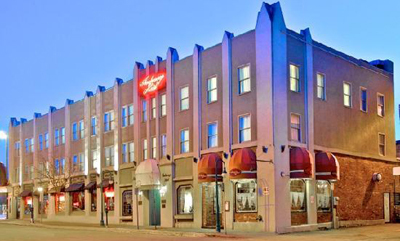 Historic Anchorage Hotel - "Where Ghosts Are More than Just Stories: Curtains rumbling, shower curtains swaying, pictures flying—it's all par for the course at the Historic Anchorage Hotel. Stories of ghostly happenings have been circulating at the hotel for many years and are considered to be related to the death of the first Chief of Police, Jack Sturgus. On February 20, 1921 at 9:15 p.m., Anchorage's first Police Chief John J. "Black Jack" Sturgus was found shot in the back with a bullet from his own gun, steps away from the Historic Anchorage Hotel. It is rumored that his ghost returns to the scene of the crime each year, haunting the location of his untimely death, seeking justice for a crime still unsolved to this day." THE HISTORIC ANCHORAGE HOTEL - established 1916. THE 1886 CRESCENT HOTEL & SPA - opened in 1886. 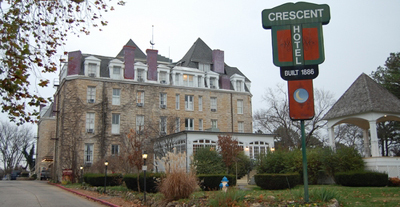 "At America’s Most Haunted Hotel, the 1886 Crescent Hotel & Spa legend has been formed from the many guests who checked out but have never left." Beverly Wilshire - since 1928. 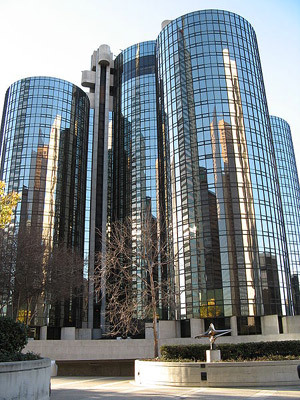 9500 Wilshire Boulevard on the east side of South Rodeo Drive. THE BEVERLY HILLS HOTEL AND BUNGALOWS CNT SDA. Opened on May 12, 1912. 9641 Sunset Boulevard. The hotel is owned by Hassanal Bolkiah, the current Sultan of Brunei. CYPRESS INN - owned by actress Doris Day. Hotel del Coronado - beachfront luxury hotel in the city of Coronado, just across the San Diego Bay from San Diego, California. It is one of the few surviving examples of an American architectural genre: the wooden Victorian beach resort. It is the second largest wooden structure in the United States (after the Tillamook Air Museum in Tillamook, Oregon) and was designated a National Historic Landmark in 1977 and a California Historical Landmark in 1970. When it opened in 1888, it was the largest resort hotel in the world. It has hosted presidents, royalty, and celebrities through the years. The hotel has been featured in numerous movies and books. HOTEL ROOSEVELT - opened on May 15, 1927. 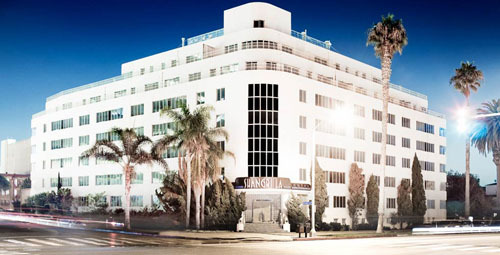 One of the most famous hotels in Los Angeles and one of the most haunted places in the world: Montgomery Clift's ghost is thought to haunt ROOM 928, where he stayed whilte filming From Here to Eternity, and can still be heard playing his trumpet. His spirit has also been spotted on the eighth floor; Marilyn Monroe's ghost has been seen reflected in a mirror in ROOM 229 and dancing in the hotel's ballroom. The ghost of glamorous movie star Carole Lombard, wife of Clark Gable, has been spotted on the 12th floor, where she and Gable often stayed. Hotel del Charro - (1951-1972). Was a resort hotel, famous for its discreet hospitality to deal-making politicians, wealthy industrialists, and Hollywood celebrities, including Richard Nixon, Joseph McCarthy, J. Edgar Hoover, John Wayne, William Powell, Elizabeth Taylor, Mel Ferrer, and La Jolla native Gregory Peck. MONTAGE - Orange County luxury spa resort. THE QUEEN MARY HOTEL - RMS Queen Mary is a retired ocean liner that sailed primarily in the North Atlantic Ocean from 1936 to 1967 for the Cunard Line. Alexandria Hotel - since 1906. 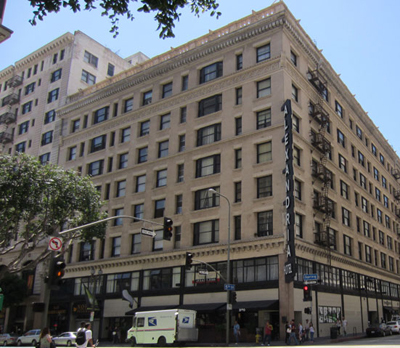 Historic building constructed as a luxury hotel at the beginning of the 20th century in what was then the heart of downtown Los Angeles. The hotel was the most luxurious in Los Angeles for a number of years until the construction of the Biltmore Hotel three blocks west in 1923. Due to its elegant design and the fact that its public rooms sat disused for decades, it has been the site of countless film shoots, and its iconic PALM COURT ballroom is a protected Los Angeles landmark. In its heyday from 1911 to 1922, it was the scene of speeches by U.S. Presidents William Howard Taft and Woodrow Wilson and Gen. John J. Pershing. It is also the room where Paul Whiteman, later known as the "Jazz King", got his start as a bandleader in 1919, where Rudolph Valentino danced with movie starlets, and where Hollywood held its most significant balls during the early days of the motion picture business. AMBASSADOR HOTEL - (1921-2005). Location of the famous nightclub Cocoanut Grove and the June 5, 1968 assassination of presidential candidate Robert F. Kennedy. HOTEL BEL-AIR - since opening in 1946, the 103-room facility located on 701 Stone Canyon Road, has served celebrities, heads of state and dignitaries. The boutique hotel is now owned by Hassanal Bolkiah, the current Sultan of Brunei. THE CARNEROS INN - Napa Valley resort: a vineyard oasis ideally nestled among 27 acres. "We offer 86 individual cottages, including 10 suites, set amid landscaped courtyards allowing for optimal seclusion and exclusivity." 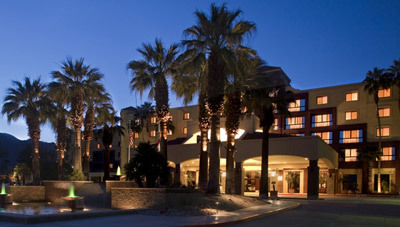 Courtyard Palm Springs Hotel - by Marriott. 1300 E Tahquitz Canyon Way. EAST CANYON HOTEL + SPA - 288 E Camino Monte Vista. HILTON PALM SPRINGS - 400 E Tahquitz Canyon Way. Hyatt Palm Springs - 285 North Palm Canyon Drive. PALM MOUNTAIN RESORT & SPA - 155 South Belardo. RENAISSANCE PALM SPRINGS HOTEL - 888 E Tahquitz Canyon Way. RIVIERA PALM SPRINGS - 1600 North Indian Canyon Drive. MARK HOPKINS - opened on December 4, 1926. Shangri-La SLH. "Hidden away on a high Santa Monica bluff, overlooking the ocean and Santa Monica Pier, Hotel Shangrila is a timeless boutique haven." 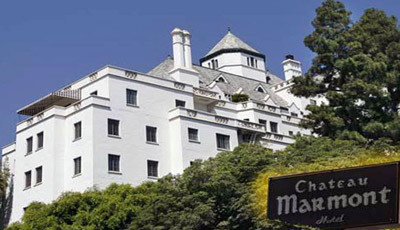 CHATEAU MARMONT - hotel and bungalows. Opened as a hotel in 1931. HOTEL JEROME - built the hotel in 1889 to emulate the great European hotels such as London's fabled Claridge's and George V in Paris. 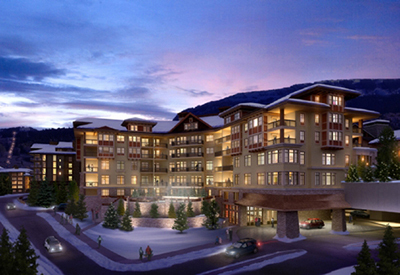 "Often hailed as the premier Aspen hotel." 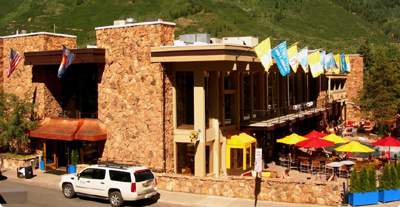 Little Nell - "Aspen's only five-star, five-diamond property, and the only hotel with ski-in, ski-out access to historic Aspen Mountain." SKY HOTEL - luxury boutique hotel. Antlers Hotel - Colorado Springs lodge opened by William Jackson Palmer in 1882 and which was replaced after the original hotel burned. The Broadmoor - 5-star/5-diamond Historic Hotel of America with over 700 rooms, 18 restaurants and cafes, and a world-class spa. Built in 1918 as the "Grand Dame of the Rockies", it was one of the finest resort destinations along the Rocky Mountains during the age of railroads. The resort with hotel is a popular conference destination for businessmen and government officials. The hotel sits at an elevation of 6230 feet (1900 m) above sea level. THE BROWN PALACE HOTEL & Spa - since 1892. 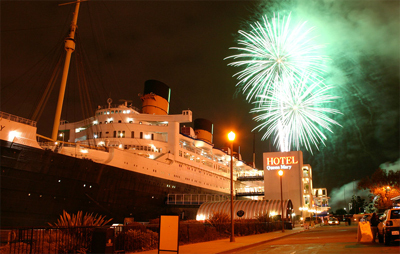 Past guests include the "Unsinkable" Molly Brown (she stayed at the hotel only a week after the Titanic disaster), infamous Denver crime boss Jefferson "Soapy" Smith, Dr. Sun Yat Sen (just before becoming the president of the new Republic of China), Queen Marie of Romania, the Duke of San Macario, and The Beatles. Presidential guests include Theodore Roosevelt, William Taft, Warren Harding, Harry S Truman, Dwight D. Eisenhower and Bill Clinton. 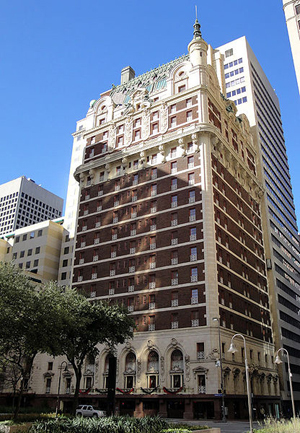 The hotel was the site of the high profile 1911 murders in which Frank Henwood shot and killed Sylvester Louis "Tony" von Phul and accidentally killed an innocent bystander, George Copeland, in the hotel's "Marble Bar." Henwood and von Phul were rivals for (or shared) the affections of Denver socialite Isabel Springer, the wife of wealthy Denver businessman and political candidate John W. Springer. The murders culminated in a series of very public trials. People who are into the paranormal will get more than their share of ghost stories in the hotel. One which stands out from the rest is that of Mrs. Louise Crawford Hill. She ruled Denver society from her room in the hotel, room 904, which was her home for fifteen years (1940-1955). Later, when the hotel began to offer tours, the story of her life and heartbreak over a lost love were told to the visitors. Strangely, the switchboard suddenly began to receive calls from room 904. But this was impossible, as at the time, the room was undergoing renovation and had no furnishings, lights, carpet, or telephone lines. Before long, the story was eliminated from the tour and the telephone calls from room 904 stopped coming. THE STANLEY HOTEL - supposedly Stephen King wrote most of 'The Shining' in room 217. HAUNTINGS: Many believe the Stanley Hotel is haunted, having reported a number of cases of ghostly activity, primarily in the ballroom. Kitchen staff have reported to have heard a party going on in the ballroom, only to find it empty. People in the lobby have allegedly heard someone playing the ballroom's piano; employees investigating the music purportedly found nobody sitting at the piano. Employees believe that particular ghost is of Freelan O. Stanley's wife, Flora, who used to be a piano player. 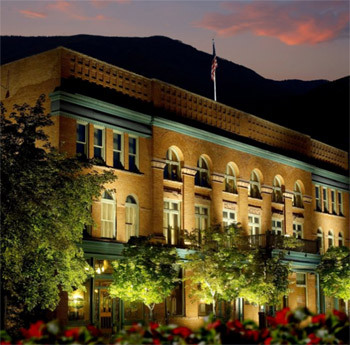 Ghost Adventure Package: This creepy experience includes a guaranteed 4th Floor room, a K2 Meter per reservation, a glow-in-the-dark Stanley Hotel squishy ghost per person, a REDRUM mug per person. Hotel That Inspired ‘The Shining’ Builds on Its Eerie Appeal - The New York Times. Omni Shoreham Hotel - "Since 1930, the luxurious Omni Shoreham Hotel in Washington, D.C. has played host to presidents, world leaders and inaugural balls, making it a true Washington landmark." THE HAY-ADAMS - since 1928. LHW. Slogan: "Where nothing is overlooked but the White House." Luxury hotel located at 800 16th Street NW in Washington, D.C. Lafayette Square and St. John's Episcopal Church, also known as the Church of the Presidents, are located across the street. The WILLARD - since 1816. 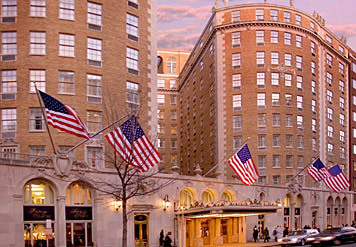 Historic luxury Beaux-Arts hotel located at 1401 Pennsylvania Avenue NW. 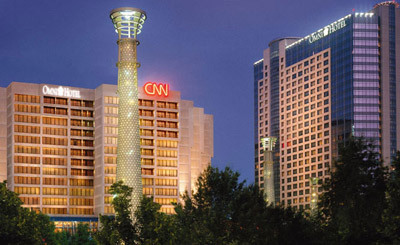 Among its facilities are numerous luxurious guest rooms, several restaurants, the famed Round Robin Bar, the Peacock Alley series of luxury shops, and voluminous function rooms. It is two blocks east of the White House. Trump International Hotel - 1100 Pennsylvania Avenue NW. 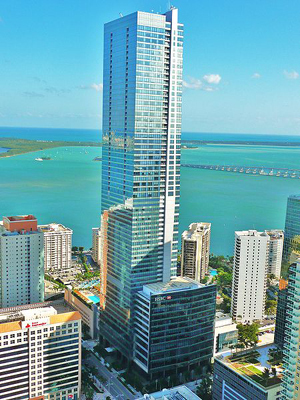 Four Seasons Hotel Miami - it is also the tallest building in Miami as well as in Florida. 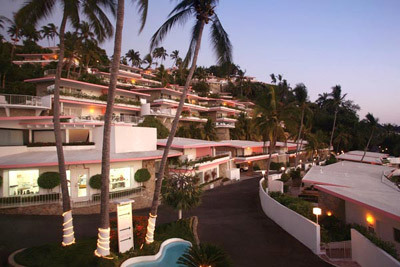 Eden Roc - completed in 1955-56. 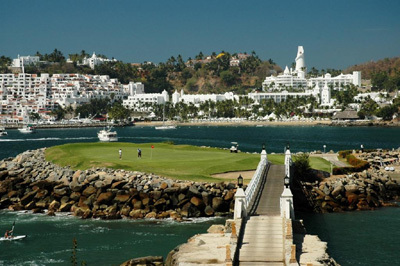 Has been a favorite of distinguished guests from politicians to Hollywood's top stars. FOUNTAINEBLEAU - opened in 1954. 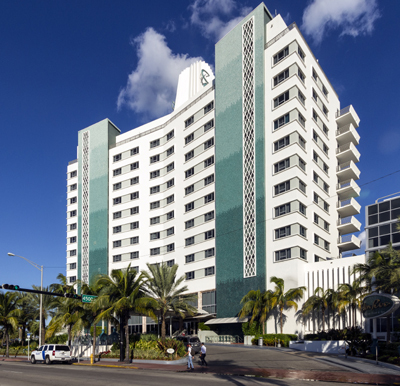 One of the most historically and architecturally significant hotels on Miami Beach. THE RALEIGH CNT - 1775 Collins Avenue. 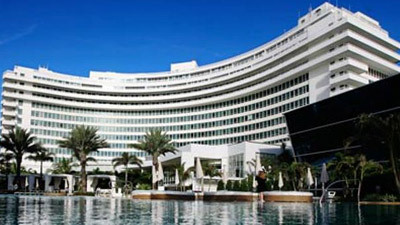 Cardozo HOTEL - 1300 Ocean Drive. 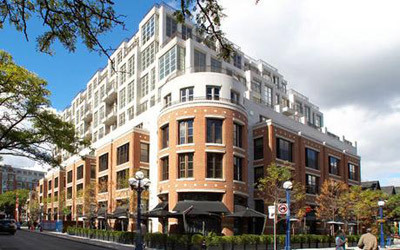 Delano HOTEL - 1685 Collins Avenue. The 1994 renovations were designed by Philippe Starck. THE BETSY SLH - "The Betsy is Miami's only literary hotel." 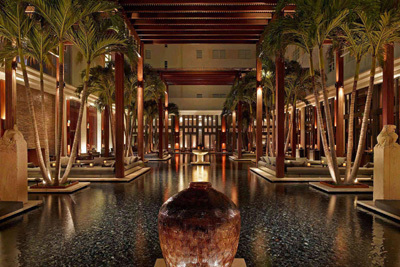 THE SETAI LHW CNT - 2001 Collins Ave. The Villa By Barton G. LHW. 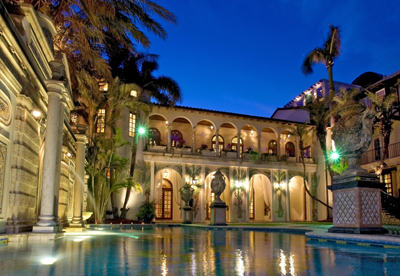 The former Versace Mansion (Casa Casuarina) at 1116 Ocean Drive. Ambassador Hotel & Spa ***. 2730 South Ocean Boulevard. Bradley Park Hotel ***. 280 Sunset Avenue. Eau Palm Beach Resort & Spa *****. 100 S. Ocean Blvd., Manalapan. Fairfield Inn & Suites ***. 2870 South Ocean Boulevard. 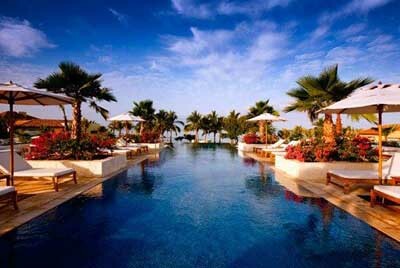 Four Seasons Resort *****. 2800 South Ocean Boulevard. Omphoy Ocean Resort & Spa ****. 2842 South Ocean Boulevard. Palm Beach Oceanfront Inn ***. 3550 South Ocean Boulevard. Royal Poinciana Hotel - (1894-1934). 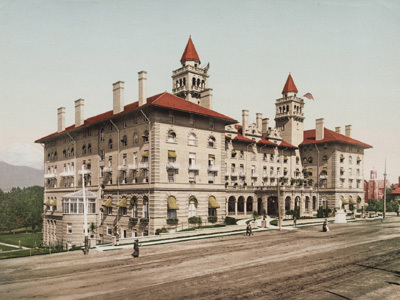 Was a Gilded Age 1,150-room hotel in Palm Beach. Enlarged twice and doubling in size each time, it became the largest wooden structure in the world, with 1,700 employees and accommodations for 2,000 guests. It closed and was razed during the Great Depression. The Brazilian Court ****. LHW. 301 Australian Avenue. THE BREAKERS - (re)opened on December 29, 1926. *****. 1 South County Rd. THE CHESTERFIELD ****. SLH. 363 Cocoanut Row. THE COLONY ****. 155 Hammon Avenue. Ponce de LeÓn Hotel - was an exclusive hotel in St. Augustine, Florida, built by millionaire developer and Standard Oil co-founder Henry M. Flagler and completed in 1888. In 1968 the hotel became the centerpiece of the newly-established Flagler College. THE MAUNA LANI BAY - hotel and bungalows. 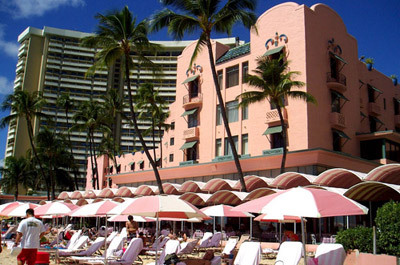 THE ROYAL HAWAIIAN - opened on February 1, 1927. 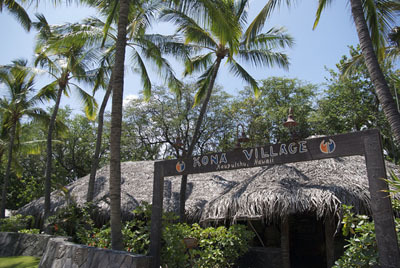 Kona Village Resort - CLOSED May 2011. Lost to the tsunami in March 2011. Had people like Steve Jobs and celebrity figures as repeat guests. Westin Maui Resort & Spa - Maui, Hawaii, U.S.A. Features an 87,000 square-foot aquatic playground with 5 pools, spa tubs hidden by tropical waterfall gardens and a 128-foot water slide. HILTON CHICAGO - landmark hotel in downtown Chicago. 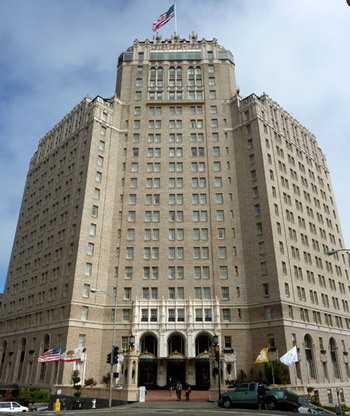 The hotel originally opened in 1927 as the Stevens Hotel ("City Within a City"), and at that time it was the largest hotel in the world. Palmer House - A Hilton Hotel - since 1875. "Feel as though you arrived some place special – rich in the history of Chicago, yet comfortably cool … The Palmer House is a place where hip came to visit ..." Famous and historic hotel in Chicago in the city's Loop area. Soho House - hotel and members' club in the Fulton Market District. THE DRAKE - since 1920. Luxury, full-service hotel. One of Chicago's landmark hotels. Designed in the Italian Renaissance style. HOTEL BAKER - opened in 1928. 21C MUSEUM HOTEL - is the first of its kind-a 90-room hotel dedicated to world class luxuries, Southern-style hospitality and contemporary art from living artists. 714 NICHOLLS STREET - owned by film director Francis Ford Coppola. 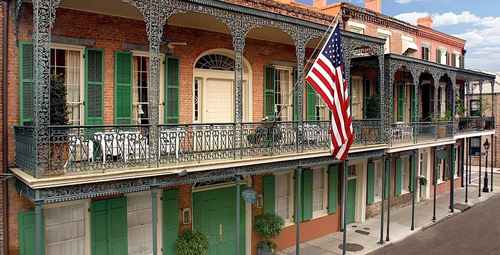 BOURBON ORLEANS HOTEL - "A French Quarter Treasure." HOTEL MONTELEONE - 214 Royal Street in the French Quarter of New Orleans. Built in 1886 in the Beaux-Arts architectural style with an eclectic flair. 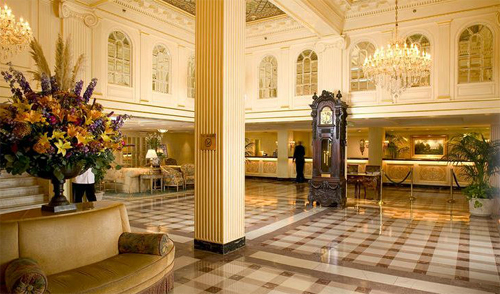 Hotel Monteleone is a historic landmark. Hyatt Regency - 601 Loyola Ave. Le MÉridien New Orleans - 333 Poydras Street. MAISON DE VILLE - 727 Rue Toulouse. 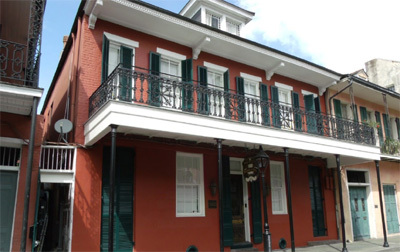 Omni Royal - 621 St Louis St.
SONIAT HOUSE SLH. 1133 Chartres St. The Roosevelt - since 1893. "Luxury. History. Celebration. It’s all at The Roosevelt". 130 Roosevelt Way. TAJ BOSTON LHW. 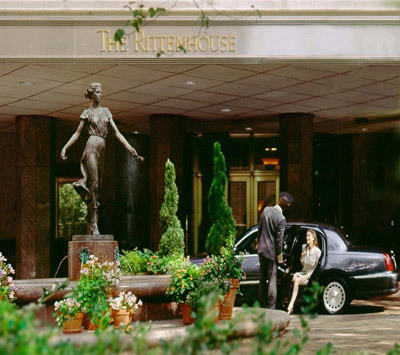 The hotel has been in continuous operation since it opened in 1927 as The Ritz Carlton. 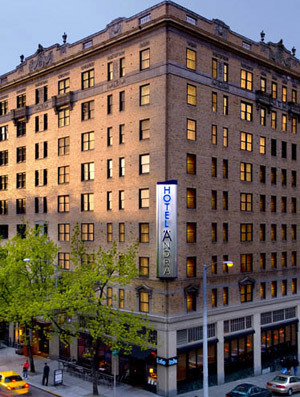 HAWTHORNE HOTEL - historic landmark hotel. Opened in 1925. Rooms 325 and 612 said to be haunted. BELLAGIO RESORT & CASINO LHW CNT. Opened on October 15, 1998. CAESARS PALACE HOTEL CASINO. Opened on August 5, 1966. 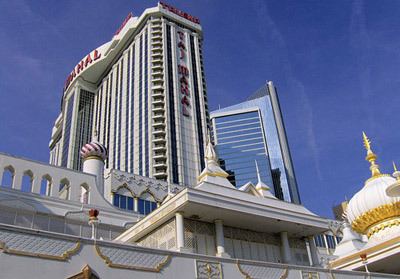 SAHARA HOTEL CASINO - (1952-2011). SANDS HOTEL CASINO - (1952-1996). 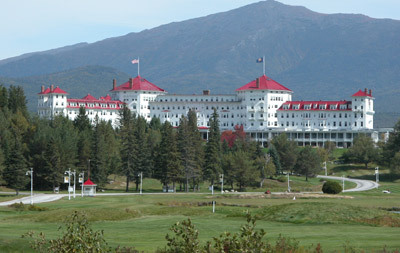 Mount Washington Hotel - host of the Bretton Woods International Monetary Conference in July 1944. TRUMP TAJ MAHAL CASINO HOTEL SDA. Opened on April 2, 1990. ACE HOTEL - 12-story hotel in the heart of Midtown Manhattan. The unique new boutique hotel has 269 rooms and is located near the Theater District. Also Michelin-starred restaurant, The Breslin, inside Ace Hotel New York. Barbizon 63 - since 1927. Formerly The Barbizon Hotel for Women, was symbolic of the cultural change as women began to come to New York City for professional opportunities, but still wanted a "safe retreat" that felt like the family home. It is located at 140 East 63rd Street, on the Upper East Side of Manhattan, New York City. Courtyard + Residence Inn - 1717 Broadway. North America's tallest hotel opens in midtown Manhattan on December 29, 2014. 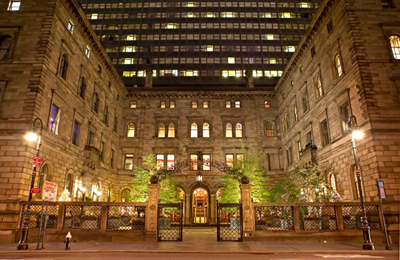 DREAM HOTEL - five-star boutique hotel housed in a landmark 1895 Beaux-Arts building. 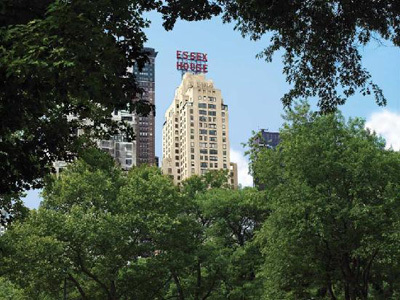 ESSEX HOUSE - luxury hotel located on 160 Central Park South in Manhattan. "Since opening its doors in 1931, the JW Marriott Essex House New York has served as an iconic Central Park hotel, delivering exceptional experiences for its guests." HÔTEL AMERICANO - luxury boutique hotel located in the middle of Chelsea's art gallery district. HOTEL CHELSEA - built in 1883. Opened as hotel in 1903. "World renowned residence for artists, musicians, writers, philosophers, and characters of the most singular and eccentric stripe which the imagination might conjure." Hotel St. Moritz - (1930-1999). 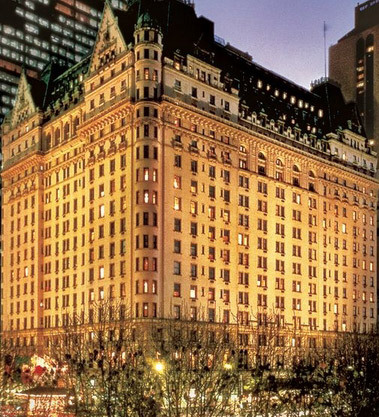 Remodeled and reopened in 2002 as The Ritz-Carlton New York, Central Park. JANE HOTEL - since 1908. "In 1912, the survivors of the Titanic stayed at the hotel until the end of the American Inquiry into the ship’s sinking." 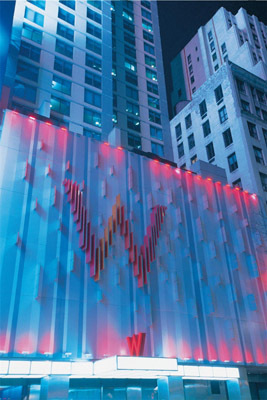 QUIN - New York City’s newest luxury lifestyle hotel, debuted on November 11th, 2013 and is located on the corner of 57th Street and 6th Avenue. Royalton New York - the first hotel designed by Philippe Starck. Sheraton New York Times Square Hotel - completed in 1962 as The Americana of New York. One of the world's top 100 tallest hotels, and one of the tallest hotels in New York City; it has 51 floors. 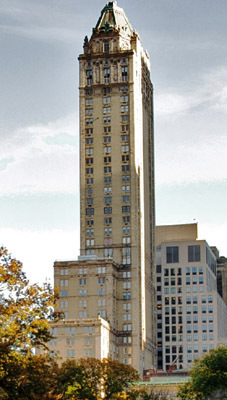 ST. REGIS - built by one of the wealthiest men in America, John Jacob Astor IV, as a companion to the Waldorf-Astoria Hotel, of which he owned half, at the time located 20 blocks south on Fifth Avenue. THE ALGONQUIN HOTEL - opened in 1902. New York City Historic Landmark. 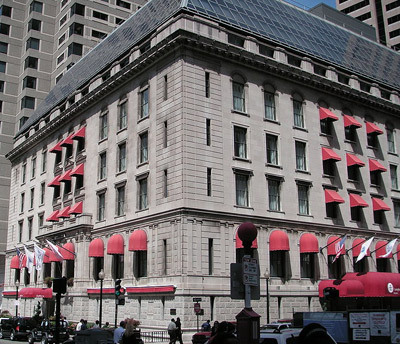 In 1919 the hotel became the site of the daily meetings of the Algonquin Round Table, a group of journalists, authors, publicists and actors who gathered to exchange bon mots over lunch in the main dining room. THE BOWERY HOTEL - located in the fashionable SoHo area in lower Manhattan, is a luxury boutique hotel with an eclectic flair. 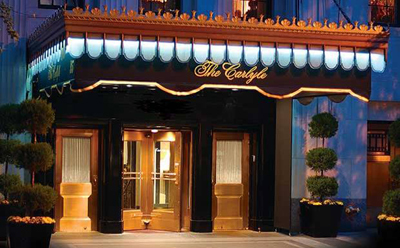 THE CARLYLE CNT SDA. Combination luxury and residential hotel. The Gore - "Luxury Boutique Hotel in South Kensington." THE GREENWICH HOTEL LHW. Owned by actor Robert De Niro. THE JANE HOTEL - completed in 1908. 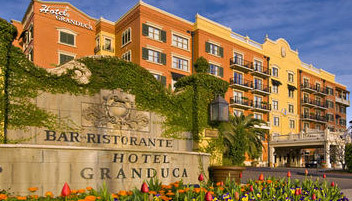 THE LOMBARDY HOTEL - upscale European-style boutique suite hotel. THE NEW YORK PALACE SDA - 455 Madison Avenue. 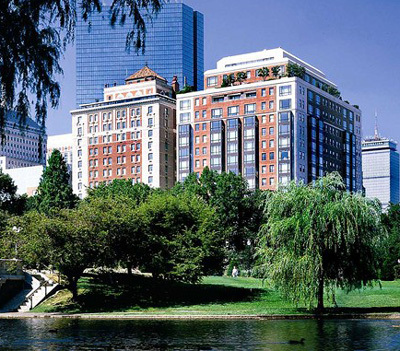 Hotel combining the historic landmark Villard Mansion with a modern 55-story tower. THE PLAZA - opened in 1907. The only New York City hotel to be designated as a National Historic Landmark with The Waldorf-Astoria. THE RITZ-CARLTON - 50 Central Park South. THE ROOSEVELT HOTEL - opened in 1924 at the height of the Jazz Age, the "Grand Dame of Madison Avenue". 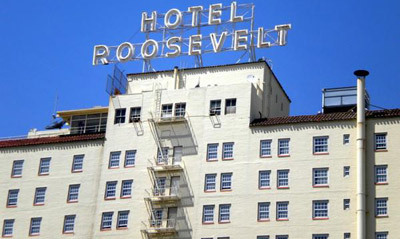 The Roosevelt Hotel has been seen in several major motion pictures, including The French Connection, Hanky Panky, Quiz Show, Wall Street, Maid in Manhattan, 1408 and Mad Men. THE STANDARD HOTEL - "High Line NYC Boutique Hotel." The Vanderbilt - from its 1912 completion until it was converted to apartments in 1965, this was the Vanderbilt Hotel, one of the city's most fashionable in the early 20th Century. Singer Enrico Caruso lived here in 1920 and 1921, his last U.S. home. The Vanderbilt - from its 1913 completion until it was converted to apartments in 1965, this was the Vanderbilt Hotel, one of the city's most fashionable in the early 20th Century. Singer Enrico Caruso lived here in 1920 and 1921, his last U.S. home. THE WALDORF ASTORIA - opened in 1931. 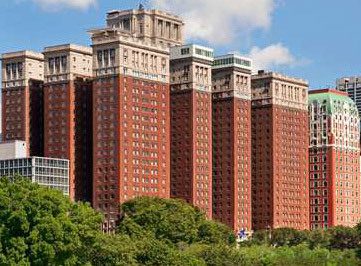 The only New York City hotel to be designated as a National Historic Landmark with The Plaza. The Waldorf Astoria Digital Archive. W NEW YORK - TIMES SQUARE - 1567 Broadway at 47th Street. "Signature Whatever/Whenever service, your wish is our command." SMYTH TRIBECA - "Takes the idea of a boutique hotel to an entirely new level." THE GREENWICH HOTEL - actor Robert de Niro's 88 room luxury hotel. VIANA HOTEL AND SPA SLH. Long Island's only Feng Shui luxury hotel. BILTMORE - America's largest home and more! TIMBERLINE LODGE - declared a National Historic Landmark in 1977. used for the front exterior of the filming of Stephen King's horror story 'The Shining' by film director Stanley Kubrick. 20 Best Newport Hotels on TripAdvisor - Prices & Reviews. Book the best Newport hotels - Hotels.com. Castle Hill Inn R&C **** 590 Ocean Avenue. Forty 1° North Hotel & Marina Resort ***** 351 Thames Street. Hotel Viking - since May 25, 1926. **** 1 Bellevue Avenue. 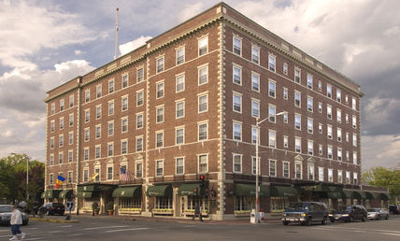 "The award-winning Hotel Viking is situated atop Newport's Historic Hill neighborhood with breathtaking views of Bellevue Avenue." Hyatt Regency Newport **** 1 Goat Island. MILL STREET INN SLH *** 75 Mill St.
Newport Beach Hotel & Suites *** 1 Wave Ave, Middletown. Newport Marriott< *** 25 America's Cup Avenue. The Chanler at Cliff Walk ***** 117 Memorial Blvd. The Newport Harbor Hotel & Marina *** 49 America's Cup Avenue. The Wynstone **** 232 Spring St.
Vanderbilt Grace ***** 41 Mary Street. The Sanctuary - at Kiawah Island Golf Resort. ELVIS PRESLEY'S HEARTBREAK HOTEL - 3677 Elvis Presley Blvd. The Driskill - since 1886. The oldest operating hotel in Austin, and one of the best-known hotels in Texas generally. 604 Brazos Street. The Adolphus - since 1912. Upscale hotel and Dallas Landmark in the Main Street District of Downtown Dallas. The Hotel has been named one of the top ten in the United States by Condé Nast Traveler and also receives high ratings from Zagat, Fodor's and Frommer's. 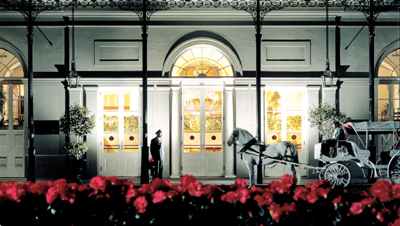 HOTEL GALVEZ & SPA - historic hotel opened in 1911. The Greenbrier - "America's Resort." Five-star resort. 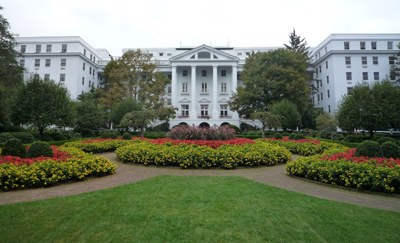 A total of 26 presidents have stayed at The Greenbrier. The Greenbrier is also the site of a massive underground bunker that was meant to serve as an emergency shelter for the United States Congress during the Cold War. PFISTER HOTEL - opened in 1893. 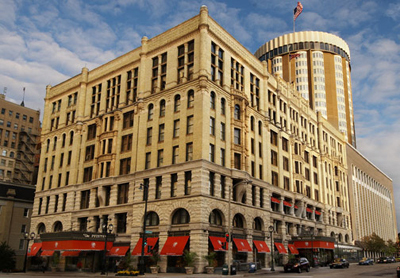 The Pfister hotel has the largest Hotel collection of Victorian art in the world and has won the AAA Four Diamond award twice. 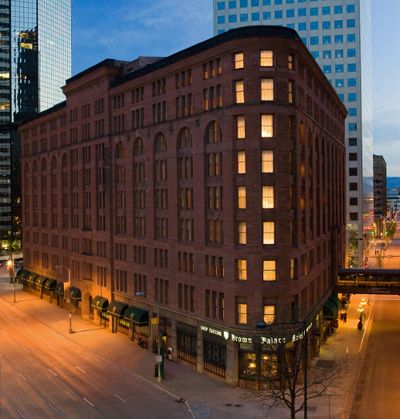 THE IRON HORSE HOTEL - Milwaukee’s most chic and sophisticated property.